Pomelo is an evergreen arbor; the tree could grow as tall as 5-10 meters, and each leaf consists a big leaf and a small leaf. Its blossom period is from February to May, it has many flowers, which give off a slight aroma. The fruit of the tree is very big and look like pears, and the largest ones could be as heavy as 3 kilograms. The skin of grapefruit is rather smooth, and its colors are green or light yellow. In the recent years, the researchers of the Tropical Botanical Garden, based on their many years practice, cultivated many famous grapefruit varieties, such as "Chinese name:Mansailong, "Chinese name:Menlunyou"and "Chinese name:Dongshizao"etc. 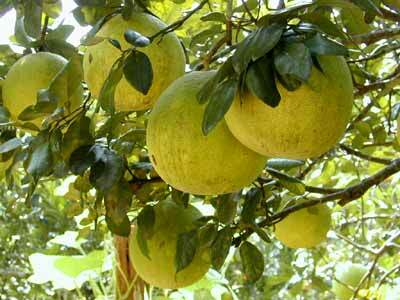 These fruits are large, rich in water contents, and sour and sweet in taste. They are loved by the local people and are sold very well on the domestic markets. For the time being, these varieties have been popularized millions of mu and the local people obtained very good economic efficiencies from them. Grapefruit is one of the most important sub-tropical fruits and is widely planted in all provinces in the south of the Yangtze River; and in foreign countries such as Vietnam, India, and Burma etc. Grapefruit is also a widely planted fruit. Its roots and leaves could be used as medicines, and its flowers, leaves and fruit skins could be used to distill balmy oil.